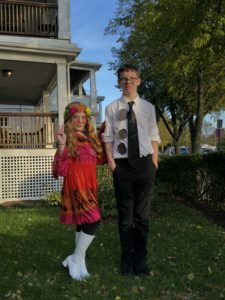 This year both kids got to wear their costumes to school! Aidan was 3 hold punch Jim from the Office. And Brendan was a hippie. They had fun trick or treating on Broadway and with their friends. This entry was posted in Family News by Nicole. Bookmark the permalink.